OFFICIALLY FINALLY SUMMER ... weather and calendar tell me so.. .HOORAY!! If I am not in my bare feet, I am in flip flops... isn't everyone? Like mother like daughter, I believe that my daughter & I wear them until the snow flies... and sometimes after that, I know we try. 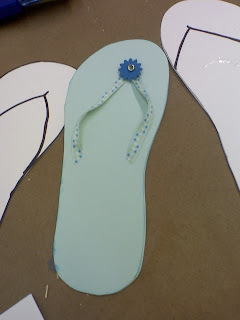 So here is my sketch of a flip flop for a card... best used as an invite, but I like it. Its rough - but then again, it was almost midnight when I finally got an acceptable template created. 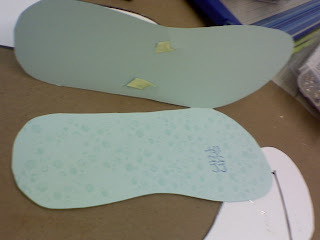 And yes I did create a left and right foot template! Aren't they fun!!! Thanks for looking! How fun! Thanks for the inspiration!